As much as I am loathed to admit it, Summer is gone and I have begun to think about Winter, packing away all the linens and flip flops is always a tough job and I have to admit I am not one of those people who look forward to the Winter months, I see a lot of comments about loving candles and open fires and while I get it, the thought of being freezing cold and soaked with rain and snow fills me with utter dread. 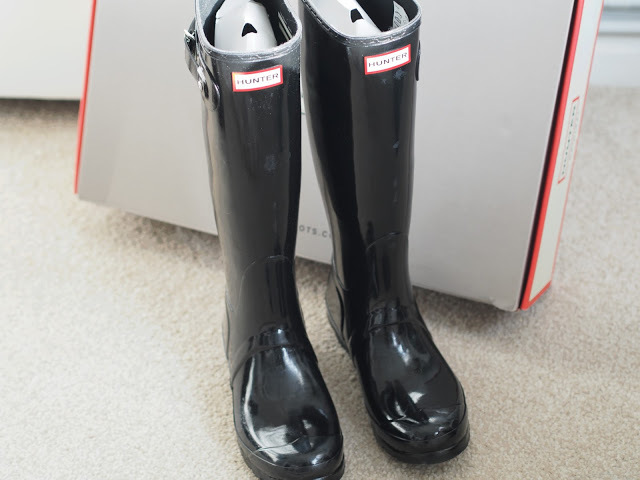 I have to admit that I am actually pretty chuffed to have seen so many pairs of Hunter Wellies on the internet of late. I had my first pair when I moved from London to the Countryside back in the late 80'/early 90s with my Hunters and Barbour I thought I looked the part commuting up to town in my country gear, those were the days when Hunters only came in the standard green and were an essential item if you lived anywhere near a field ! who knew they would be come the ultimate festival fashion item ? not that I go to festivals - oh no, I like a bed and clean loo's at my age. that will last, my last pair were actually 7 years before they gave up the ghost. If wellies are not your thing you will still find yourself spoilt for choice with JD Williams in terms of boots and footwear, I love the fact that they come in width sizes ( we are not all the same standard size ) and there are a ton of brands to choose from. Check out the JD Williams boot range here.